Changing the Odds for Children at Risk provides a framework based on seven essential principles for implementing more effective programs and policies. Following these essential principles, chapters describe programs for changing the odds for children, when the cognitive gaps are beginning to form, in these earliest years of their lives. In a highly readable style, it highlights programs that are making a difference in children's lives across the country, weaving together narratives that compellingly tell a story of hope and promise for our most disadvantaged children. Multimedia and Literacy Development represents the state-of-the-art in multimedia applications and their promise for enhancing early literacy development. The volume broadens the field of reading research by looking beyond print-only experiences to young readers' encounters with multimedia stories on the Internet and DVD. The Child/Home Early Language and Literacy Observation (CHELLO) is an observational tool designed to rate the early literacy environment in home-based child care settings. Ideal for developing accurate profiles of quality language and literacy practices in family/group child care settings. 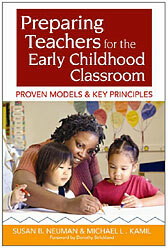 "An indispensable resource for parents of preschool children. 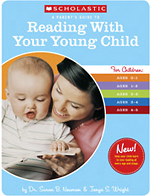 Instilling a love of reading is one of the most important gifts you can give to your children, and this guide provides all the tools and inspiration you'll need to do it." "Reading achievement in the earliest years may look like it's just about letters and sounds—but it's about much more than that. Successful reading consists of knowing a relatively small store of unconscious procedural skills, accompanied by a massive and slowly built-up store of content knowledge. By linking early literacy to content learning, we can provide children with the purposeful, knowledge-building experiences they need to be successful readers and writers." Neuman, S.B. (in preparation). Changing the Odds. Neuman, S.B. & Wright, T.S. (2007). A parent's guide to reading with your young child. New York: Scholastic Inc.
Neuman, S.B., Roskos, K., Wright, T.S., Lenhart, L. (2007). 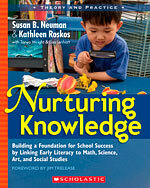 Nurturing knowledge: Building a foundation for school success by linking early literacy to math, science, art, and social studies. New York: Scholastic Inc.
Neuman, S. & Panoff, R. (1985). Exploring Feelings. Atlanta, GA: Humanics Limited. ISBN 0893340375. Neuman, S. & Roskos, K. (1993). Language and literacy learning in the early years: An integrated approach. Fort Worth: Harcourt, Brace & Jovanovich. ISBN 0030768462. Neuman, S.B. & McCormick, S. (Eds). (1995). Single-subject experimental research: Applications for literacy. Newark, DE: International Reading Association. ISBN 0872071286. Neuman, S. (1995). (Second Edition). Literacy in the Television Age. Norwood, NJ: Ablex. ISBN 1567501613. Neuman, S.B. & Roskos, K. (1998). Children achieving: Instructional practices in early literacy. Newark, DE: International Reading Association. Gambrell, L., Morrow, L.M., ISBN 0872071936. Neuman, S.B., & Pressley, M. (Eds.). (1999). Best Practices in Literacy. New York: Guilford Press. ISBN 1572308753. Neuman, S.B., Copple, C., & Bredekamp, S. (2000). Learning to read and write: Developmentally appropriate practice. Washington, DC: National Association for the Education of Young Children. ISBN 0935989870. Neuman, S.B. & Dickinson, D. (Eds) (2001). Handbook for Early Literacy Research. NY: Guilford Publications. ISBN 157230653X. Neuman, S.B et al. (2001). Access for All: Closing the Book Gap for Children in Early Education. Newark, DE: International Reading Association. ISBN 0872071715. Dickinson, D. & Neuman, S.B. (2006). Handbook for Early Literacy Research: Volume II. New York: Guilford Publications. Edited by Susan B. Neuman, Ed.D., & Michael L. Kamil, Ph.D.
For more details, Download a Flyer (prepteachers.pdf).